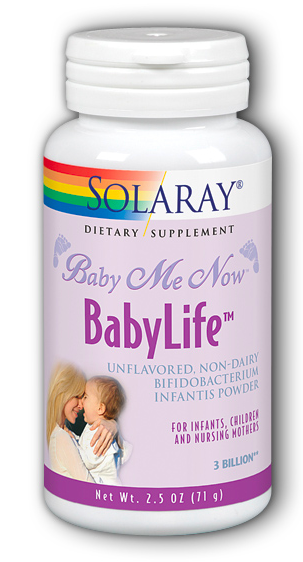 BabyLifeTM Powder, dietary supplement, non-dairy, Freeze-dried bifidobacteria infantis. For infants, small children, expectant and nursing mothers. Over 4 billion living organisms per gram. Directions: Use only as directed. Infants and young children take 1/2 to 1 level scoop twice daily. Expectant and nursing mothers take 3 to 6 level scoops daily. Should be offered to infants during regular feedings. May be added directly to infant formula (add after heating formula). Others should consume one hour before meals or two hours after meals. Do not take within two hours of taking antibiotics. KEEP REFRIGERATED.